The fragility of the liberal democratic state after 1789 is illustrated in the history of the European Jews from the French Revolution to the Holocaust. Emancipation and hope of emancipation amongst the European Jewish population created a plethora of Jewish identities and forms of patriotism. 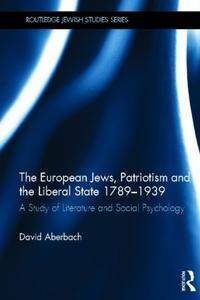 This book takes the original approach of studying European Jewish patriotism as a whole, with particular attention given to creative literature. Despite their growing awareness of racial, genocidal hatred, most European Jews between 1789 and 1939 tended to be patriotic toward the countries of their citizenship, an attitude reflected in the literature of the time. Yet, the common assumption among emancipated Jews that anti-Semitism would fade in a world governed by reason proved false. For millions of European Jews, the infinite possibilities they associated with emancipation came to nothing. The Jewish experience exposed many of the weaknesses and failings of the liberal multicultural state, and demonstrated that its survival cannot be taken for granted but is dependent on vigilance and struggle. By focusing on Jewish patriotism from 1789-1939, this book explores the nature of the liberal state, how it can fail, and the conditions needed for its survival.